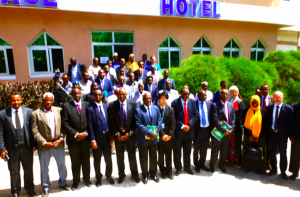 12-02-2018, Mogadishu (Somalia): The Intergovernmental Authority on Development (IGAD) yesterday launched the National Consultation Workshop towards the development of the IGAD Protocol on Free Movement of Persons in the IGAD Region in Mogadishu during an inauguration session with Mr. Ali Mohamed Ali, Permanent Secretary of the Ministry of Foreign Affairs of Somalia, as the Guest of Honour. This four-day workshop is aimed at getting inputs from national stakeholders and Experts on benefits and barriers to free movement of persons; deriving National Recommendations towards the Provisions of the Protocol and Developing a Road Map for the Negotiation and adoption of the Protocol on Free Movement of Persons in the IGAD Region. This National Consultative Workshop is bringing in experts on migration and related themes as well as all national stakeholders from each of the Ministries and Authorities of Government, Civil Society Organizations, Academia, Private Sector and Media to contribute to effective migration governance. Speaking for IGAD Executive Secretary, Dr Ahmed Hassan-HIV & Health Senior Advisor at the Health & Social Development Division, recalled that the creation of a Regime of Free Movement of Persons in the region was an aspiration in the Agreement Establishing IGAD of 1986. He continued that the IGAD Secretariat mandate therefore was to “facilitate Member States to develop a common understanding of benefits and barriers of this Regime of Free Movement of Persons in the Region”. “The Federal Republic of Somalia is also expected to provide to the IGAD Secretariat information on critical measures and requirements to be acted upon that can fast track the effective conclusion and adoption of this Protocol,” he concluded his opening remarks. The Ambassador of Ethiopia to Somalia, the Deputy Special Representative of the Chairperson of the African Union Commission (DSRCC) for Somalia, representatives from the European Union, UNHCR, IOM, as well as high level dignitaries from Somalia including the Permanent Secretary of the Ministry of Foreign Affairs of Somalia and the Director General of Internal Security gave keynote speeches in support of the process while highlighting the benefits of a Protocol for the free movement of persons in the region. b) To generate national recommendations towards the Provisions of the Protocol on Free Movement of Persons in the IGAD Region. IGAD has received a grant from the European Union Emergency Trust Fund with the intention of facilitating the establishment of a free movement regime within the IGAD region. This is aimed at promoting the regularization of the high volume of informal movement that currently takes place, and increase the opportunities for legal mobility.